The Greatest Thing in the World is a popular work by Henry Drummond, who was a Christian missionary during the nineteenth century. In this publication, Drummond discusses his concept of how long is the most important ingredient in achieving and living a successful life. This is book and its important message, has inspired many readers who have embraced Drummonds ideas and adopted them in their own life. 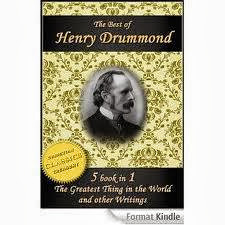 The Greatest Thing in the World is highly recommended for those who enjoy the writings of Henry Drummond and also for those who are looking for an inspirational book to help the, succeed in life.